If extensive mountain climbing isn’t your thing but you are still looking for some adventurous activities to do near Bar Harbor, here are some fun and exciting attractions in the area. Many of these activities are right on the way to Bar Harbor or still around Acadia National Park. Located in Trenton on the way to Bar Harbor. Bring your family for a fun filled day at Wild Acadia Fun Park. This park offers a variety of activities for everyone. There are certain size requirements for some activities. Check out their website to see their rules for each activity. Closed toed and heeled shoes are a must! Wild Acadia Fun Park allows you to bring your own food into their facility, but they do have a snack shack open if you don’t want to worry about packing anything. Right near the Hancock County-Bar Harbor airport in Trenton, schedule your trip to fly over Acadia and Schoodic Point. Call ahead and plan your own excursion if you want to expand from what they offer. You can choose flights that last anywhere from 15 minutes to a couple hours. Take a solo trip or fly 2 people at a time. If you are a looking for a spook-tacular tour, check out Bar Harbor Ghost Tours. Hear about Wabanaki and Indian ghost stories as you tour through the town of Bar Harbor to 3 of the most haunted buildings in the area. The 1923 Criterion Theatre is one of the stops during the trip when there are no live theater performances . If this particular spot is one you want to make sure to see, call ahead to make sure that this location is on the tour schedule. No guarantees that you will have any encounters with orbs or spirits, but their website provides other tour goers who had their own encounters. 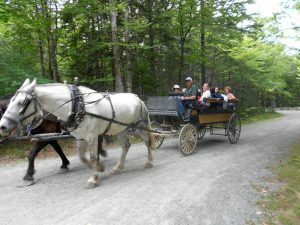 If you are looking for less extensive and accessible roads to walk on the carriage trails are highly suggested for you to enjoy and still get to experience the beauty of the Acadia National Park. You can still go on adventurous trails off of the carriage trail to Day Mountain near the Jordan Pond area of the park or stay on the carriage trails. The carriage trails are prohibited from car access which makes this the perfect location for those who want to walk, bike or ride horses on the roads. Rockefeller Bridge Tour- a 2 hour tour around the numerous granite bridges and trails that were built by philanthropist John D. Rockefeller Jr. in the 2oth century. Day Summit- a 2 hour tour to the top of Day Mountain, once at the top, you can get out of the carriage and take in the views of the Cranberry Isles. 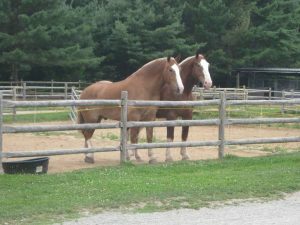 Contact the stables to book your own tour and time. The carriage trails are worth taking advantage of it you are limited on time but still want to site see.